DALLAS – The Retina Foundation of the Southwest and SMU’s Bobby B. Lyle School of Engineering are pleased to announce a collaboration to create the Clinical Center of Innovation for Age-Related Macular Degeneration to be housed at the Retina Foundation, supported by a $2.5 million grant award from the W. W. Caruth, Jr. Foundation at Communities Foundation of Texas (CFT). This new collaborative venture will help to rapidly prototype new diagnostic and clinical treatment approaches, focusing on the specific needs of patients who are losing their vision to age-related macular degeneration. Dr. Karl Csaky, Chief Medical Director and T. Boone Pickens Senior Scientist at the Retina Foundation of the Southwest, will be leading this joint venture with the help of Dr. Marc Christensen, Dean of SMU’s Lyle School of Engineering. Age-related macular degeneration is a progressive, degenerative disease of the retina and is the most common cause of vision loss for individuals 50 years and older. Currently, there are 18 million Americans who have some form of age-related macular degeneration. It is projected that the population over the age of 60 will double by the year 2030, which will dramatically increase the number of individuals affected by this disease. At present there are few effective treatments for the majority of patients who suffer from age-related macular degeneration. Since 1982, the Retina Foundation of the Southwest has been on the leading edge of basic research to better understand age-related macular degeneration and how it works to destroy central vision, which is necessary for reading, writing and driving. The Foundation also works closely with patients in a clinical setting to better understand the vision loss they are experiencing over time. SMU’s Lyle School of Engineering is dedicated to the role of innovation in finding solutions to real-world problems and has a dedicated space for those pursuits – the Deason Innovation Gymnasium. The Lyle School will help to accelerate the clinical application of technologies. 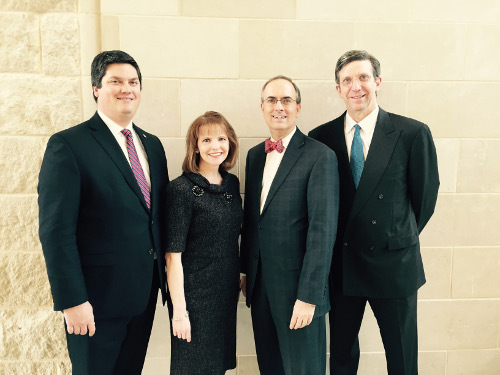 The opportunity presented by the W. W. Caruth, Jr. Foundation at CFT to collaborate with the Retina Foundation of the Southwest supports SMU and the Lyle School in the University’s commitment to increased research being advanced by the Second Century Campaign. The Retina Foundation of the Southwest, located at 9600 N. Central Expressway in Dallas, is one of only two independent nonprofit eye research institutes in the country. The Foundation is a leader in research on macular degeneration, causes and treatments of infant eye disorders, and cures for inherited retinal diseases. Each year, researchers at the Retina Foundation provide advanced visual evaluations free of charge to patients ranging in age from infants to seniors. Visit www.retinafoundation.org to learn more about the Retina Foundation of the Southwest. Call to schedule a tour at 214-363-3911. SMU is a nationally ranked private university in Dallas founded 100 years ago. Today, SMU enrolls approximately 11,000 students who benefit from the academic opportunities and international reach of seven degree-granting schools. SMU’s Bobby B. Lyle School of Engineering, founded in 1925, is one of the oldest engineering schools in the Southwest. The school offers eight undergraduate and 28 graduate programs, including masters and doctoral degrees. As the largest community foundation in Texas and one of the largest in the nation, Communities Foundation of Texas (CFT) works with families, companies and nonprofits to strengthen our community through a variety of charitable funds and strategic grantmaking initiatives. The foundation professionally manages 900 charitable funds like the W. W. Caruth, Jr. Foundation and has awarded more than $1.4 billion in grants since its founding in 1953. cftexas.org. In establishing his foundation in 1974 as a part of the Communities Foundation of Texas, William Walter Caruth, Jr.’s philanthropic goals were to support frontier-advancing projects in education, scientific research, medical advancement and public safety. He gave generously during his life to support the causes he believed in, and he left the bulk of his estate to CFT to continue to meet community needs today and well into the future with innovative investments. http://www.cftexas.org/ww-caruth-jr.-foundation.